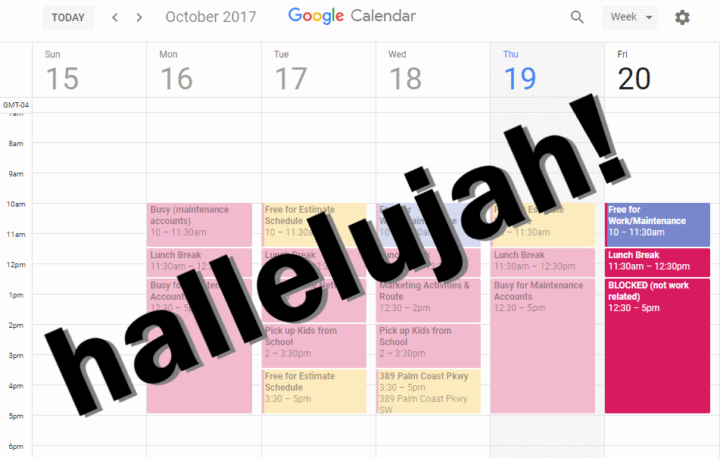 Google Calendar 2017 Update, Hallelujah! Yes it was time to get a New Look for Google Calendar! Google was launched in 1998. Google calendar was launched in 2006. 1998, yes that’s the 20th Century. 2006, you’re correct, that is the 21st Century. But even though Google Calendar was launched in 2006, it looked and felt like it belonged in 1998. A whole eleven years after the original launch, the look and feel of Google calendar practically has not changed. But on October 18, 2017, finally Google Calendar gets a facelift, a new look. We’re referring to the web-browser version of the calendar… On a smartphone app, it’s already looking sharp and great. But the web-browser version was the one figuratively stuck in 1990s. Google is notorious for running things excessively in Beta mode (or making users feel like they are using a Beta version of a google software). Beta mode is essentially a test mode, a functional solution, but incomplete. With Beta mode, design is in the background, and core-functionality is in the foreground. So, for 11 full years since its launch, Google calendar felt like it was in test, trial mode. Good engineering, yes… Core functionality, yes… But good design…no, not so much. With the Google calendar update on October 18, 2017, the new web-browser version of Google calendar is finally looking great, feeling great, and functioning great. If you think good design does not add to function, think again. At Office Divvy, for our Call Desk (Professional Phone Answering Service), we use Google calendar for appointment scheduling functions. We find that the Google Calendar is super easy to share across our Call Desk team, and with the end users (our clients) alike. Accessible from multiple devices, it’s the perfect calendar solution. So, when we saw the Google Calendar 2017 upgrade, we could not be happier! And, oh, yes, please do leave a comment about the new look of Google calendar. The good, the bad, the ugly is all welcome! I have been transitioning to Google Calendar. I had not even noticed the upgrade button! Painless and fast upgrade. I already like the different time periods being in a dropdown instead of spread across the screen.